Who says comforting food has to be unhealthy? This hearty butternut squash and chickpea stew is both nutritious and satisfying. The bright and warm Moroccan flavors will be a welcome surprise to taste buds exhausted by holiday overindulgence. It’s time for another virtual lunch date with my pals on twitter, and today we’re eating hearty stews. As I mulled over some stew ideas, my first thought was to create something with beef and butternut squash. I knew I had a squash on the counter and some tri-tip in fridge and the combination sounded like a great one for stew. But when my coffee-addled brain realized that I had already cut the tri-tip into steaks and thrown them in some marinade, I decided I’d better rethink my plan. Then I realized that I didn’t have a butternut squash sitting on the counter either. Yes, I think I am going crazy. Since I liked the idea of a stew featuring butternut squash, I picked one up at the store yesterday. I decided against buying more beef, figuring it would be more fun (and inexpensive) to create a stew using ingredients I had on hand. After surveying the contents of my pantry, I grabbed a can of chickpeas, some canned tomatoes and a half-empty bag of Israeli couscous I found stuffed way in the back. My hearty stew was coming together nicely. I ran across a few butternut squash and chickpea recipes online and they all seemed to incorporate Moroccan flavors. Since I had half a jar of preserved lemons in my fridge, I decided to follow suit. Some of the recipes included raisins, but I chose to go with dried tart cherries. While cherries might seem like an unusual ingredient for a stew, Moroccan tagines often include dried fruit and I love the combination of lemon and cherries. The stew turned out to be a great lunch and there’s a good chance I’ll be eating more for dinner. The bright flavors of preserved lemon and tart cherries contrast nicely with the warm cumin and cinnamon and I absolutely love the added texture of the Israeli couscous. I found it hard to stop eating, but the soup is healthy enough that I didn’t feel guilty after a second bowl. I hope you enjoy it as much as I did! Heat olive oil in a medium saucepan over medium-low heat. Add onions and cook, stirring occasionally, for 10 minutes, or until softened and starting to turn golden. Add garlic, cumin, coriander, and the piece of cinnamon stick and cook, stirring, for one minute. Add the tomatoes, crushing by hand as you add them, or crush with a wooden spoon in the pan. Add all remaining ingredients except for the salt. Turn up heat and bring soup to a simmer. Turn heat to low and let simmer, stirring occasionally, for 30 minutes. Add salt to taste. Remove cinnamon stick before serving. Garnish with chopped cilantro if desired. Recipe Notes: *Zest and juice of one lemon may be substituted for the preserved lemon. **I used chicken broth for my stew, but vegetable stock may be substituted to make it vegetarian. For even more flavor, substitute whole spices for pre-ground: toast whole cumin and coriander seeds in a dry pan until fragrant, let cool, then grind in a spice grinder, coffee grinder, or mortar and pestle. All spices may be adjusted to suit your own taste. I am snowed in here in Atlanta and need to cook. I have most of these ingredients. Will be attempting this tomorrow. Thanks so much! I'm really excited about these flavors- love the lemon and cherry combo. Wow! What an eye catching stew! Those colours are really beautiful together. I think I'll definitely try and make this next week. Thank you for sharing! I'm completely obsessed with Israeli couscous this week. I've had it almost every day. And now you've given me one more recipe. These are my favorite kinds of soups, made from found items! Your Butternut Squash & Chickpea Stew with Israeli Couscous looks like the perfect comfort food as I try to survive the latest Arctic Blast, and I live in the South. Love "virtual lunch date," what a fun idea! wow--this looks great! and i just bought a bag of israeli couscous yesterday--howd'ya know?? that looks and sounds wonderful! 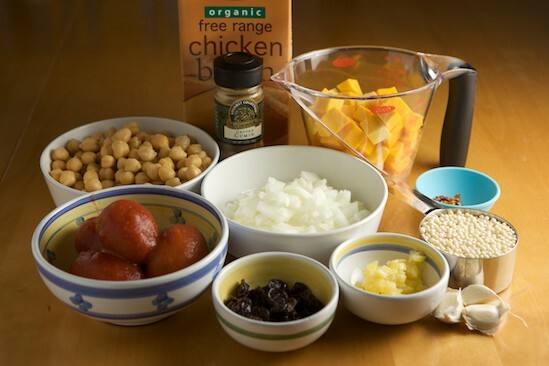 I'm going to have to make that :) I like the combo of savory/sweet with the dried fruit. Since I just made a fabulous Morrocan-flavored chickpea-containing soup, and happen to have a spare Butternut squash sitting on my counter, I'm really excited to have this recipe! Now I just need to get my hands on some preserved lemons. Hi, thanks this looks amazing. As far as I can see, Isreali couscous is not in the recipe. Am I missing something? I do all sorts of ridiculous things where I convince myself that I have ingredients that then end up nowhere-to-be-found. And then I have to cope after already having set my heart on some recipe that uses them.This looks absolutely fantastic though! And I'm so glad you made it. 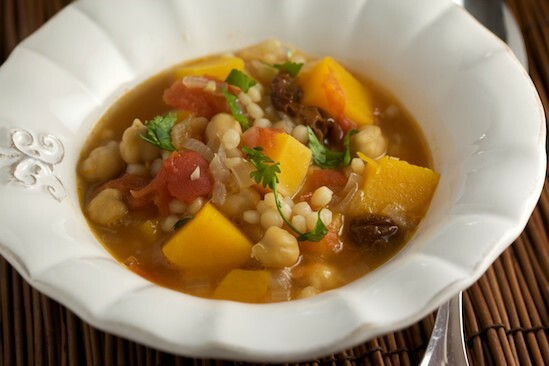 I love Moroccan flavors ...they go so well with butternut squash in this stew! It would be truly comforting to know that something this delicious could also be healthy. :) Looks delish!! Ah, looks fantastic. Something I need on this cold winter night! Thanks for sharing this recipe. I just made some for dinner and we loved it. I used dried apricots instead of cherries and it was still great. Next time I will try it in my slow cooker! This is so different than the cooking I do. I love it, I think it sounds delicious, looks wonderful too! I need to branch out and give this recipe a shot. This looks terrific. I have a few neglected jars of preserved lemons that would work wonderfully here and we love Israeli couscous. I made this last night and it is sooooooo delicious; cooked the couscous separately, not Isreali b/c I am in CV, but it was still nice. We ate it for dinner last night and lunch today! My husband, who despises soup, keeps saying, "this is delicious...more, more..." It sounds funny, but he is Cape Verdean and usually speaks dialect. He loves this soup! Thanks! I love that you do the Twitter lunch date - I remember when you did the last one. This stew sounds right up my alley as I really love Moroccan flavorings and I just bought some preserved lemons (will be making my own soon). Stew is also a great dish for this time of year too. I love butternut squash, and if I can find one around here, I'm going to make this with one - I may substitute with potimarron. Beautiful and bright for winter's gray days, I adore the colors and love that you added dried cherries, too. Hello Great recipe; we also cook similar dishes in Lebanese cuisine and our couscous is similar and made with either wheat or semolina. I have brought back some goodies from my trip to Lebanon and i am doing a giveaway if you happen to be interested! The flavors in this soup are amazing! Printing it out now and I can't wait to make it! Beautiful photos. Love alot of color in my food..that is definitely an eye catching meal. I'm getting hungry just from looking at the pictures. I think I'll try this recipe tomorrow for lunch. I love the idea that you use chickpeas...did you know they are a great source of fibre as well as of protein? You might just be my hero!! I love squash, chickpeas and couscous...can't wait to try this combo! Thanks! I'm wondering how the couscous is prepared when served as an addition to the stew like in this recipe. Looks like it is just added. I have made it as a pilaf with onions and broth toasting the couscous in some oil. BTW. The stew is cooking away on my stove and filling the house with exotic warm aromas. Just the thing for a Canadian winter evening. I have to object on the name you've given to the couscous! Firstly it is NOT Israeli...couscous originates from MoroccoI don't want to turn this to a political debate, would it be too hard to just say "Couscous"? Couscous is 100% Moroccan and NOT Israeli. Please, do not mislead users. This is perfect! My vegetarian boyfriend just tried Israeli couscous for the first time and loved it, and I've been looking for an autumn stew to make and serve in sugar pumpkins. Thank you for the answer! "Israeli couscous" (in Hebrew ?????? 'flakes' ), also called "ptitim", is a larger, baked wheat couscous-like product similar to the Italian orzo. ISRAELI COUSCOUS differs from the NORTH AFRICAN COUSCOUS. North African Couscous is made from small clumps of Semolina wheat and dates back to the 13th Century at least. Israeli Couscous is a toasted pasta made from hard wheat flower. It was invented as a replacement for rice (and originally was the same size and shape as large rice) during the austerity period in Israel (1949-1959) when a wide variety of staple foods were unavailable. Israeli Couscous tastes, smells, cooks and looks very different from regular couscous. I've been in similar situations before. It is not as easy an answer as you thought it is, its something that you'll have to write out for yourself over time. Made this several times, minus the preserved lemons. just printed recipe to make the preserved lemons, yay. can't wait to make it the 'right' way. Sooooo delish. just printed recipe to make the preserved lemons, yay. can't wait to make it the 'right' way all over again. Sooooo delish. love this stew.